People fishing in the bottom of a khlong (canal) in Pathum Thani province. This canal should be full of water. 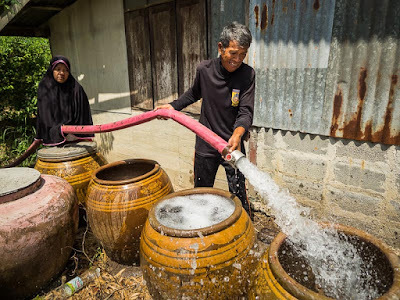 Central Thailand is running out of water. I went back upcountry earlier this week to do more photography related to the drought in Thailand and every place I went to was either dry or running dry. I talked to farmers, fisherfolk, shopkeepers and homeowners. All said they couldn't remember a dry season this dry, a rainy season with so little rain. It's the middle of July, we're weeks into a normal rainy season and it has hardly rained. A man in the muck at the bottom of a khlong. 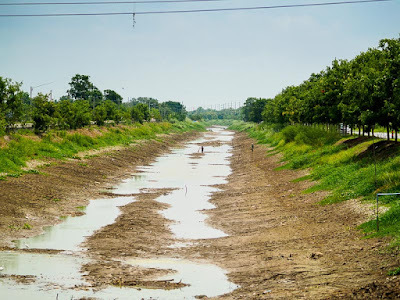 There should be two or three meters of water in this khlong, which provides irrigation water to farms and domestic water to a nearby treatment plant. 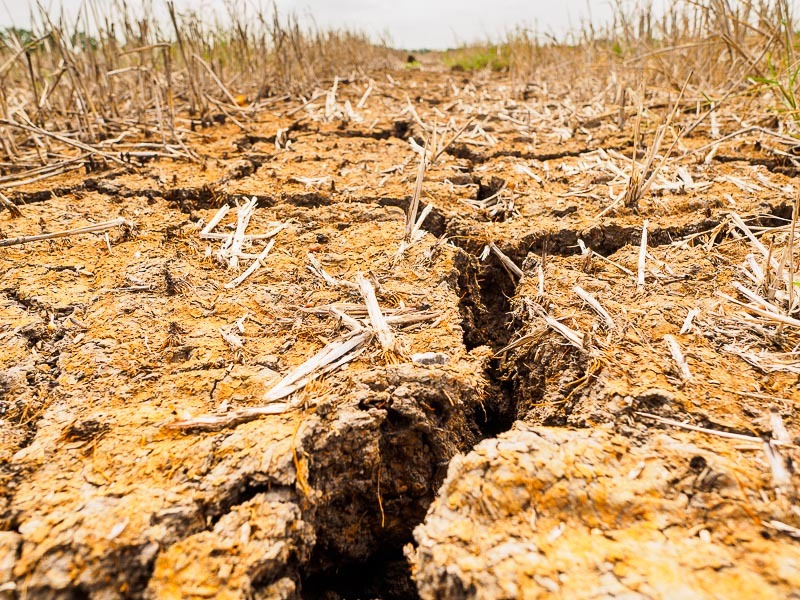 The effects of the drought are rippling through central Thailand. More than 250,000 homes in Pathum Thani, Saraburi and Ayutthaya provinces have lost their domestic water because there isn't enough water in the canals to feed the water treatment plants. Provincial authorities and the Thai army are trucking water to impacted communities, but that's not a long term sustainable solution. 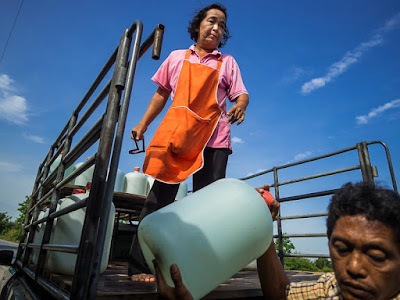 Provincial authorities deliver water to a family in Nakhon Nayok province, about 90 minutes from Bangkok. 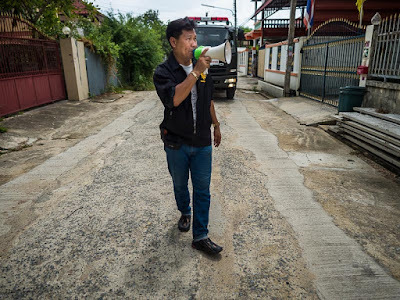 While the army delivers water to a housing estate (what would be a called a subdivision in the U.S.) in Pathum Thani about 30 minutes from Bangkok. Bottled water delivery to a village in Nakhon Nayok. Farmers in central Thailand have been told they can no longer water their fields. In some places, the army is patrolling khlongs to make sure no one takes water. For farmers who haven't planted this means there's little chance of getting a crop in this year. For farmers who have planted it's disastrous. There's a real chances that their crops (mostly rice) will wither and die. An unplanted rice field in Nakhon Nayok. 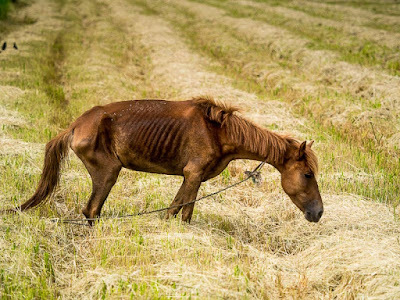 A pony grazing in a field in Nakhon Nayok. It's so dry that roads in many places in central Thailand have collapsed from subsidence, which occurs when land compacts as it dries out. 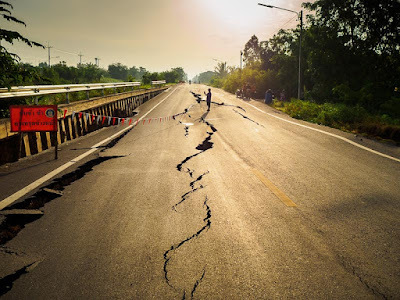 I went up to Pathum Thani and Nakhon Nayok not sure we would find a collapsed road to photograph. I found so many collapsed roads that I ended up taking detour after detour to get from town to town. 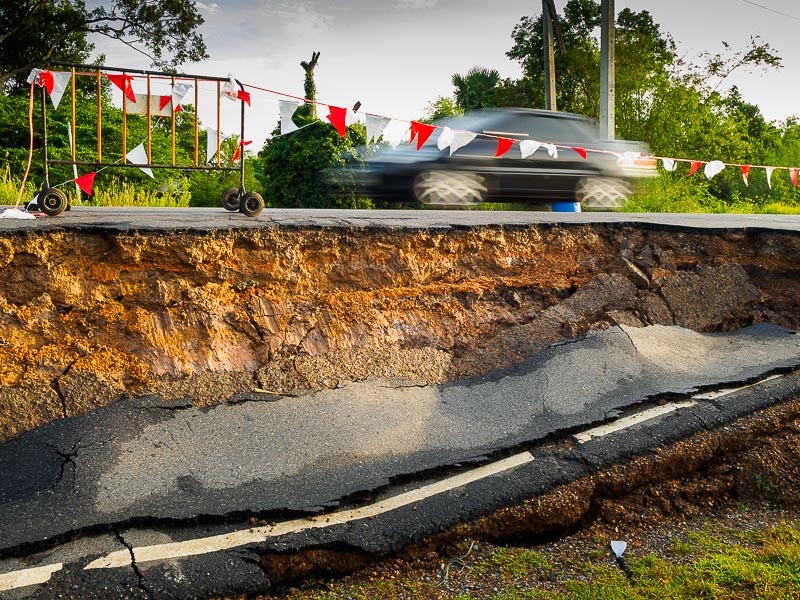 A man uses his smart phone to photograph a cracked and collapsing road. While a few kilometers away and on a different khlong traffic speeds past a badly collapsed roadway. A monk collects alms on a road that is collapsing from subsidence. The Thai government is using "cloud seeding" to make rain, stressing conservation and is doing what it can to keep some water behind the reservoirs. Government spokespersons say there's no reason to panic and that everything will be fine when the rains start in August. But there's some doubt that the rains will actually start in August. A large El Niño is settling in and could last through spring 2016. This promises to bring rain to California (which needs it) but also leaves Asia and Australia in drought. If the rains don't start in August, Thailand will face a significant drought and have to make hard decisions. There are more photos of the 2015 Thai drought in my archive.